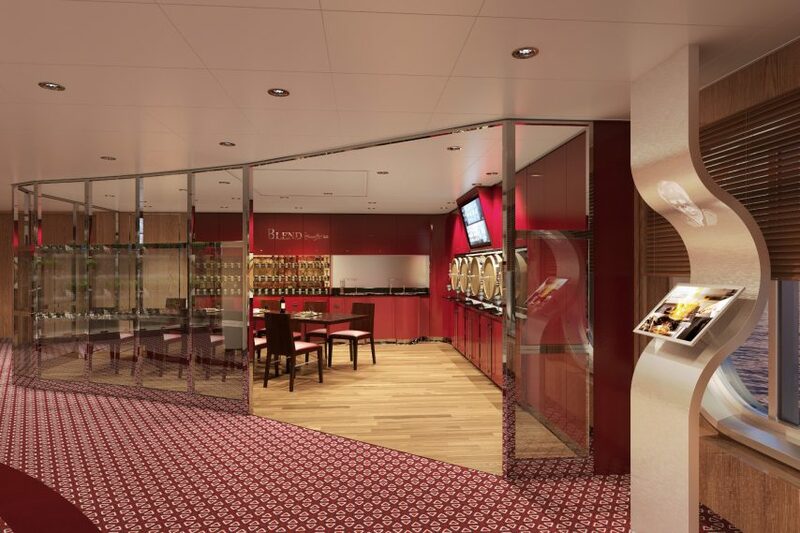 Wine lovers will be able to experience the art of winemaking at a new venue, BLEND, aboard Holland America Line’s ms Koningsdam when the ship debuts in April 2016. In collaboration with Chateau Ste. Michelle, Washington State’s oldest and most acclaimed winery, the intimate venue will enable guests to blend their own wine and enjoy it at dinner or in their stateroom. BLEND — the first of its kind for Holland America Line and the only purpose-built wine-blending venue at sea — will have a tasting table that accommodates 10 guests who can create their own blend from a selection of five barrels of single-vineyard red wine. Besides participating in the blending process, guests will learn about wine from the ship’s wine expert, who leads the blending session. After viewing a welcome video by Bob Bertheau, Chateau Ste. Michelle’s winemaker, guests will learn about the history of Washington wines and winemaking, examine soil samples, and see how different vineyard sites impact the flavors and style of the wine. The Cellar Master also will instruct guests on what characteristics, flavors, and nuances to look for in the wine from each barrel. Guests will then sample the five unique wines, featuring such varietals as Cabernet Sauvignon, Cabernet Franc, and Merlot from the winery’s Cold Creek and Canoe Ridge Estate vineyards, and make tasting notes on what they like about each. The blending begins in a graduated cylinder, with guests determining how much of each wine to include in their personal bottle. After the personalized wine blend is put into the bottle with a stopper, guests will be able to create their own label to add a personalized touch. The wine will then be sent to The Dining Room or another restaurant, where it will be waiting for the guests to enjoy with their evening meal, or guests can take the wine blend to their stateroom to enjoy at their leisure. The wine blending sessions will be held daily for a fee, and reservations are required.